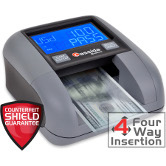 Protect your business against fake bills and forged ID cards with our reliable counterfeit detectors. Stop counterfeit losses by detecting fake bills before you accept them. 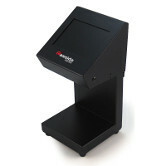 The Cassida SmartCheck is a dual UV detector with exclusive Swipe Technology. Enjoy the convenience of one-swipe detection along with the assurance of conventional visual UV inspection. 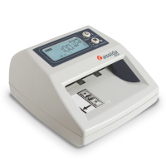 Just swipe the bill and the detector will beep if the bill is counterfeit. No training or operator knowledge needed. The Cassida InstaCheck instantly indicates whether the money you’ve taken is legitimate currency. A green light signals good currency; a red light and multiple beeps tell you the bill is suspect. 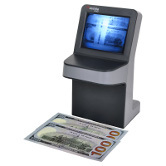 InstaCheck offers the latest infrared and magnetic ink counterfeit detectors, giving you peace of mind and confidence in your cash handling. 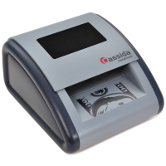 The Cassida 2230 uses powerful IR technology to authenticate infrared security features present on currency. Infrared marking cannot be seen with the naked eye, making it the most advanced currency security feature - it has yet to be counterfeited. The 2230 uses a special frequency camera to detect infrared markings and make them visible. 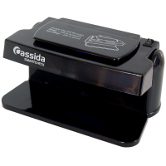 The Cassida Quattro is the world’s best automatic counterfeit detector and it’s also the easiest to use. Insert bills in any orientation — face up or face down — and instantly know whether the bill is genuine or suspect. Easy to understand PASS and FAIL indicators show if bills are legitimate or should be rejected, while the denomination of the bill is registered on screen. 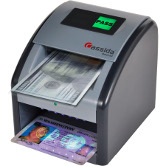 The Cassida Omni-ID combines a powerful automatic counterfeit detector with advanced ultraviolet LED illumination into a single machine that authenticates both US currency and IDs. The Omni-ID gives you confidence and protection, assuring the dollars, identification cards and checks you take are genuine. 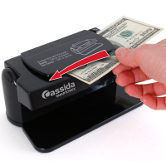 The Cassida 3300 is a fully automatic counterfeit detector that catches 100% of counterfeits, including bleached bills ($100, $50, $20 counterfeits printed on real $1 or $5 bills). Combining optical image analysis and IR (infrared), metal thread, and magnetic ink detection, even the most sophisticated forgeries are no match for the 3300.